But, one of those she mentions is finding places from outside the virtual world. We have certainly seen that problem with Second Life. 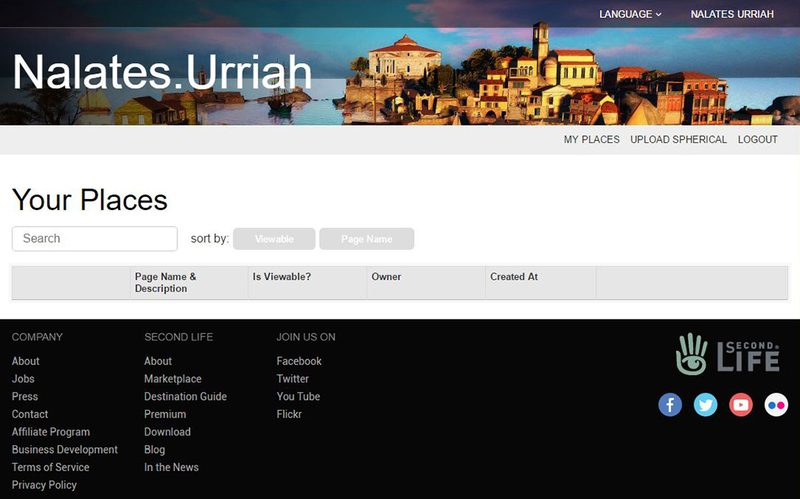 The SL team is working to change that with Places Pages, something a region owner can use to promote their place in SL. I think this not being ‘findable’ from the RL search engines has been a major problem for Second Life users building games and experiences in SL. I am certain it is a significant reason businesses stopped trying to use SL for marketing. If Sansar can correct that, it has great possibilities. Marie correctly points out people have to spend time figuring out SL to know what can be done with it. This is very true if you log into SL with no real idea what SL is. I think Marie did that. But, there are numerous tutorials and reviews spread across the web that show up when people search on various ‘How do I market __________ with VR.’ (11 million hits). So, serious people are going to show up asking not ‘what’ can I do, but ‘how’ do I do it? Unfortunately, the Lab has yet to capture that part of the search realm, whether for SL or Sansar. Nor do I see the entrance path or support for business people wanting to market real life products. If I were the Lab I would be thinking about how I would make SL and Sansar stand out in VR search results and make it easy to see how to market with VR. The idea of supplying only one part of the solution and leaving people to find the rest of the parts is a proven fail. Good solution providers provide complete solutions even if they have to pull in third-parties. There is a gotcha when promoting Second Life. A marketer never wants to sourer a possible customer on a coming future product, which is what Sansar is. A lesser product (SL) is never marketed first and foremost. The up-sale is always more difficult than the down-sale. The best is put forward first then lesser products promoted for those that don’t need or can’t afford the best. ‘For you I have such a deal, almost the best at much less cost…’ So, promoting SL heavily as a VR-type virtual worlds might confuse and disappoint many looking at VR for the first time leaving a bad taste. ‘What do you mean there is no VR support in SL?’ Capturing the VR search field for SL could be more a mistake than a good move. This entry was posted in SANSAR, Sansar News, Second Life, Virtual World News and tagged Ebbe Altberg, SANSAR, Virtual World News, VR. Bookmark the permalink. And i think here people still go complete wrong with reading the information Instances not need to mean that it’s really different worlds. I read the way the mean instances more like if one server cannot handle it we switch another server online and spread the load over all the instances. And i think people still can see and chat with each other on different instances on the same experience. I cannot believe the would implement it like your on complete different website. I think this really still wrong information. So in my eyes, secondlife can never generate more then 45FPS. everything above the 45FPS is generated and not real good. Secondlfie runs on my GF980 pretty bad , compared with high fidelity and a VR headset that runs pretty good this days. Put people try to move arguments that SL run bad still under the carpet. I’m not sure the majority of readers will understand what I wrote about shards and instances the way you did, I hope not. It isn’t just empty places where my viewer runs 90+ FPS. I have a relatively low-end gaming machine. There are some with high powered machines running 160+ FPS and over 100 FPS most of the time. Avatars are still a heavy load for most machines. But, the Lindens are working on better ACI calc’s that will likely push developers to better content yet. So, the avatar render load is likely to continue coming down. My laptop with HD Graphics at medium settings makes 10 to 20 FPS in the same places my main computer makes 90 to 150. So, old home systems are at a disadvantage. The viewer can generate more than 45 FPS. The servers never do. So, a viewer making 90 FPS will be generating two images from the exact same server provided information. At 135 FPS the viewer is using the same information for 3 frames. But, the viewer can change the camera position for each of those frames and render the scene without additional server help. The viewer also calculates where the avatar should be for any given frame. At some point, it checks its calculated position against the server’s position. Rubber banding is the effect of the two disagreeing on where the avatar is. The server wins and we see our avatar snap to a new position. The servers don’t lock the viewer FPS to their FPS. You can that by opening Viewer Stats and watching the Viewer and Server Physics FPS change independently. When the server slows to 10 or 20 FPS the viewer can still be generating 90 or whatever FPS. Plus, the viewer and server are generating different information in each frame. All the video render happens on the viewer client side and that load determines the viewer FPS. The region server is figuring out where things are, what scripts are doing, and sending us that information. Press Ctrl-Alt-Shift-U to see the viewer display the updates from the server. For now, an advantage to generating more than 45 FPS is having the time to render higher quality images. In combat games there is the advantage of keystroke events and how fast they can be sent to the server. Those with faster computers have some advantages in SL based combat games, which often have horrible lag and low server frame rates. Having more render power to get more done in a given frame time is what is needed for VR. So, for VR we would be generating 180+ FPS for smooth camera motion. That requirement is mostly for client side power. The rest of your points are valid. I do suspect you 980 could do a decent job of running SL. Several in SL run 980’s and love them. I suspect you are getting into your personal preferences when saying ‘pretty bad’.